The best part about the Jackalope Art fair was the feedback I got from people. 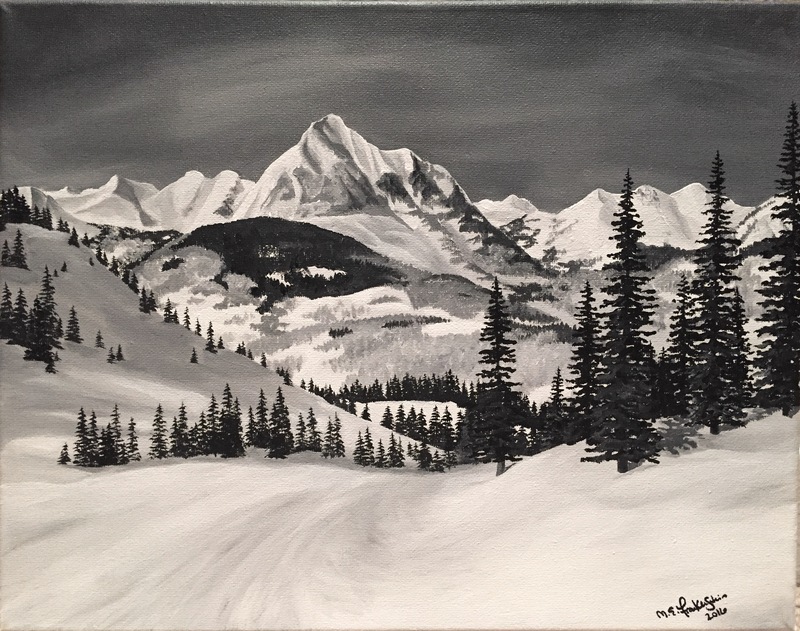 I got a lot of great responses for all of my work, but the pieces that people liked the most (and that sold best) were my black and white mountain paintings/prints. That made me incredibly happy. 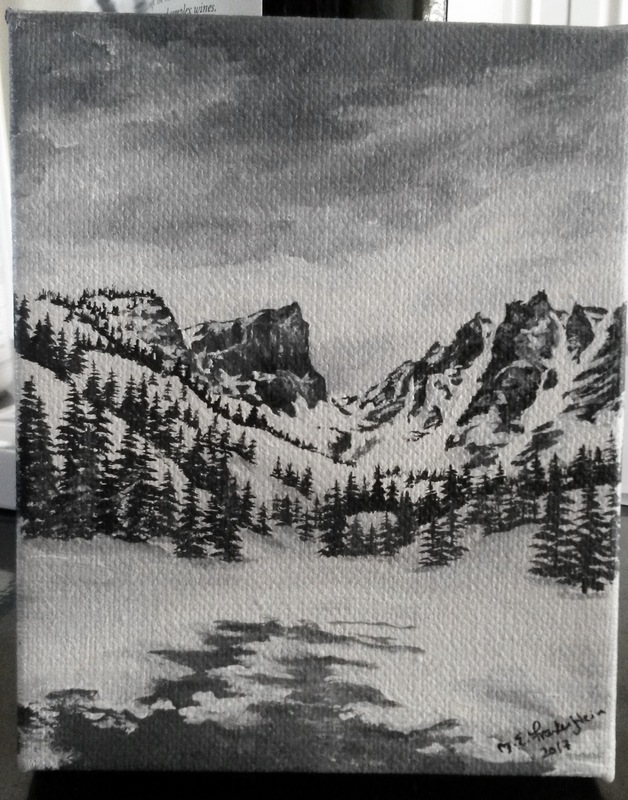 My black and white mountains have really been my true style, but I began to doubt if people would be receptive to these pieces. After seeing that strangers actually do really like my mountains, I can get back to working more on these pieces in the new year. 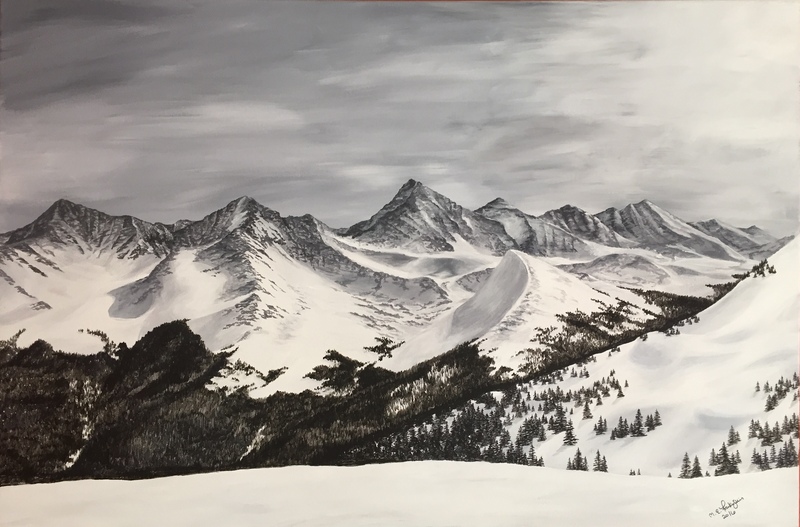 It was almost fitting that the first painting I completed in 2017 is of Resolution Bowl at Copper Mountain. Time to go on even more trips to the mountains! This view of the ten mile range is one of my favorite views from Copper Mountain ski resort. Every time I go to Copper, I take at least one picture of this view so it only makes sense to do a painting of it. I started this piece in April 2015 and by June 2015, I hit a major painter’s block. Unable to decide how I wanted to complete this piece and unmotivated to figure it out I then let it sit, half completed, for an entire year until mid June 2016. 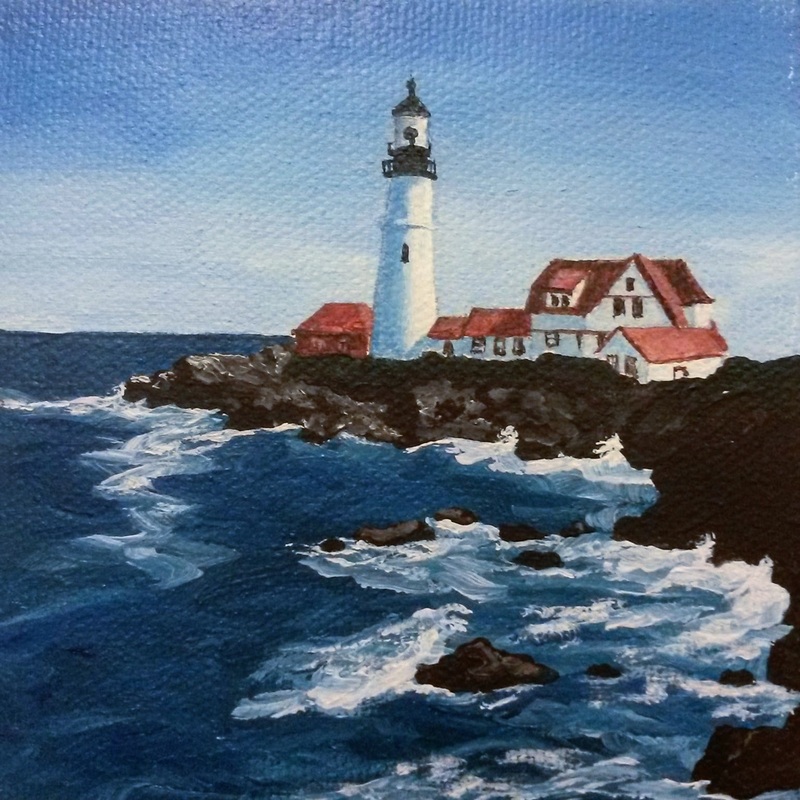 After moving into a bigger home more conducive for painting, I was finally motivated to put my brush to canvass and once I made those initial strokes, the rest quickly fell into place. I went to Crested Butte for my birthday weekend this year and fell in love. The views there are amazing and I had the best time. Two solid ingredients for inspiration. Jolie. 2016. Acrylic on Canvass 8×10. I wanted to surprise one of my best friends with a little gift because 1. she’s amazing and 2. she just got engaged. This piece managed to come together so quickly and easily thanks to multiple factors hitting at once: Work was cancelled due to a major snow dumping, my friend got engaged to a great guy with an adorable dog, and I had a new bag of coffee beans hand-delivered from Seattle. 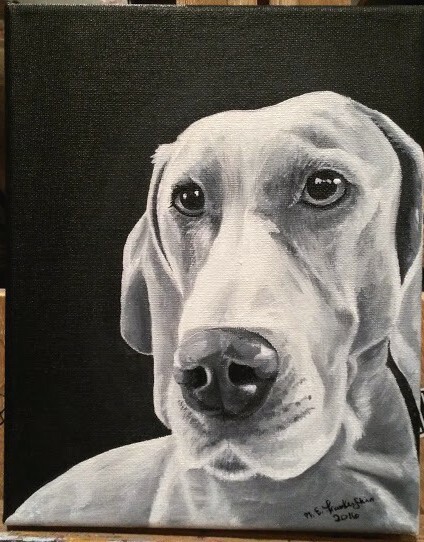 So after scrolling through both her and her now-fiance’s instagram accounts, I found a photo that would play to my strengths; using black and white to create depth, highlights & shadows, and folds. 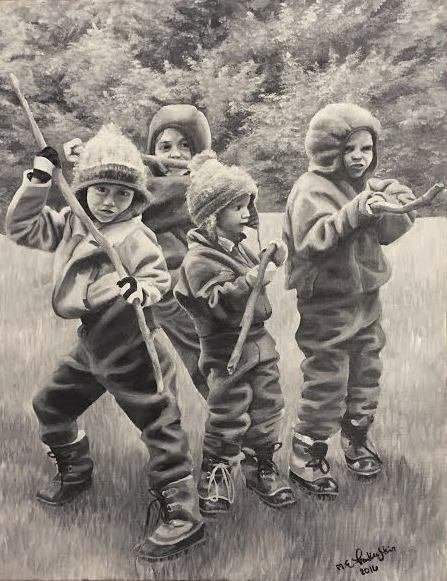 I’m quite proud of this painting that amazingly only took me a day to complete (granted, it was a long day with only breaks for more coffee and some food), so I do wish I had gotten better photos of it before shipping it to D.C.